Web of Spider-Man Previews Are Here! It’s almost July, and we’re approaching one of those sweet moments that only pops up a few times each year. Instead of toiling behind the scenes developing and producing HeroClix sets, we get to trot out our new toys and share them with the world. 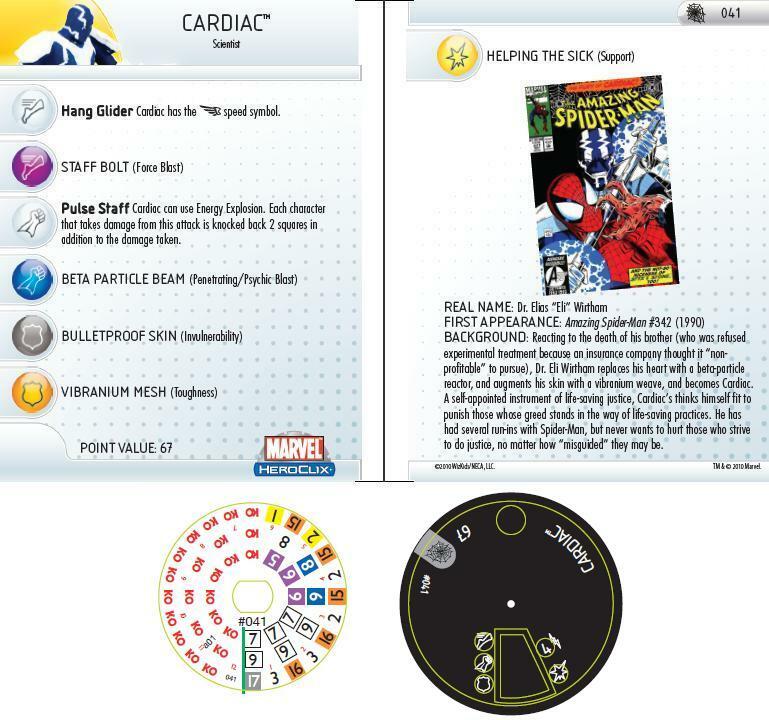 Today,I’m going to take you into our thought process as we explore Marvel HeroClix: Web of Spider-Man for the first time. First, I feel compelled to mention that a HeroClix set is quite the undertaking. Before the first figurative chisel strikes the stone, we spend weeks, sometime months developing our concepts and fire-testing them. We think, discuss, debate, revise,and iterate a great deal, trying to arrive at the best product that we can. When we decide on what to release and when, there are lots of potential puzzle pieces in play. One driver of set’s possible theme is the fanbase. We listen to what people want and keep track of teams and figs that seem to be gaining in popularity. We can unlock a good amount of untapped potential by linking the fan’s ideas and concepts together. Our vocal, passionate, active fan-base is a huge asset for market research. Our licensors also give us great tips on upcoming editorial (storylines), and include us in their long-lead planning processes. This allows us to “ride shotgun” with their marketing efforts, and also, because of the sheer volume of new sculpts we do each year, gives us the ability to dig deeply into hot new comics. The Blackest Night and Brightest Day storylines jump out as great, current examples of this. Our Secret Invasion Booster Release stands as perhaps the deepest testament of this styleof release-planning to date. Doing booster releases alongside our licensing partners is an exciting, frenetic process that lets us do hot, new stuff. Earlier this year, we took a different path on a release. We chose one character, and developed almost an entire set around him. The lightning crashed and the thunder rolled, and Marvel HeroClix: Hammer of Thor arrived with an impressive bang. 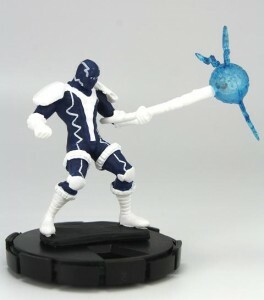 In the past HeroClix has fleshed out sets on larger, team-driven themes, but Hammer was our first gamble at putting all of our chips on one character. Thor’s universe was largely unmined in Clix form, and we were able to deliver the high-pointed, godly figures of the Thor universe (a subtle mechanical hook). Thor has done really well (thanks! ), and as we saw how well the experiment was going it made us think. Perhaps the “Hammer of…” model would be an interesting set theme to apply to select sets. In this model, it becomes critical to hit the major characters from the figure’s corner of their universe. But on top of that constraint, you guys are Clix fans. You want to see the figures that no other game can deliver. With Hammer of Thor, I think we did a great job of showcasing the Thors, Lokis, and Warriors Three of the Thor-verse, but we also had great niche characters like Fenris Wolf, Rock Trolls, and Fire Demons that probably wouldn’t appear in a non-Thor-themed set. I have a few whiteboards hanging in my office that have lists of characters that have the ability theme a “Hammer of…” set around. There are some really interesting options on those whiteboards. The most striking of the batch centered around one character in particular. He just happened to be one of the most popular characters in comic history, which helps, too. Today, I have two sneak peaks of figs for you to look at, one from each category. 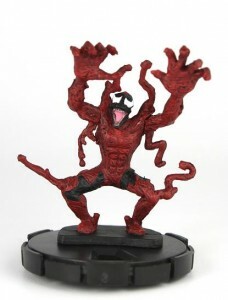 First up, I have a “need.” If you’re going to do a Spider-Man set, you got to have representatives on the Symbiote front. 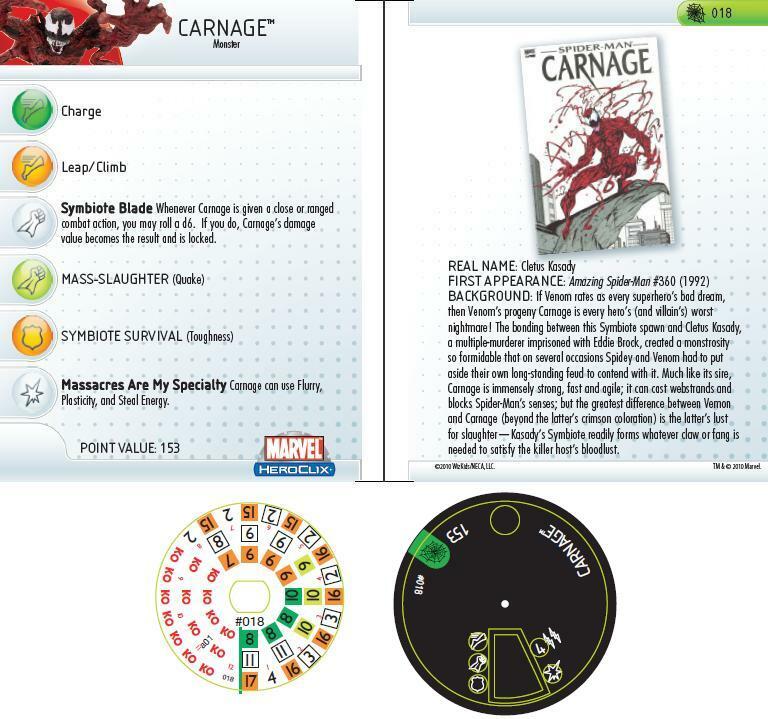 Fans have been bugging (okay, asking) me for a new Carnage since I began working on Clix years ago. Web of Spider-Man includes a powerhouse version of Cletus Kasady that is sure to guarantee “maximum carnage.” Equipped with a vicious Special “Symbiote Blade,” Carnage is a worthy adversary. Next up on my preview board is another fan-demanded piece that conveniently happens to be from the Spider-verse. Wow, that sculpt is a real shocker! All bad puns aside, what a breath-taking sculpt and paint for this awesome frie-nemy of Spider-Man. While Carnage is a top-line Spider enemy with a couple of major cross-over stories under his belt, Cardiac has a slightly longer and more nuanced relationship with our favorite webhead. He’s a perfect example of the supporting cast that makes Spider-Man’s world so rich and interesting. I can’t wait to show you more figs from the set, and in my next article, we’ll get into one of the meaty mechanics that makes Web truly innovative.